Home You n Entertainment Nick Cannon: Mariah Out, Jesus In..To Stay Forever! Nick Cannon: Mariah Out, Jesus In..To Stay Forever! Nick had a massive MARIAH tattoo on his back. 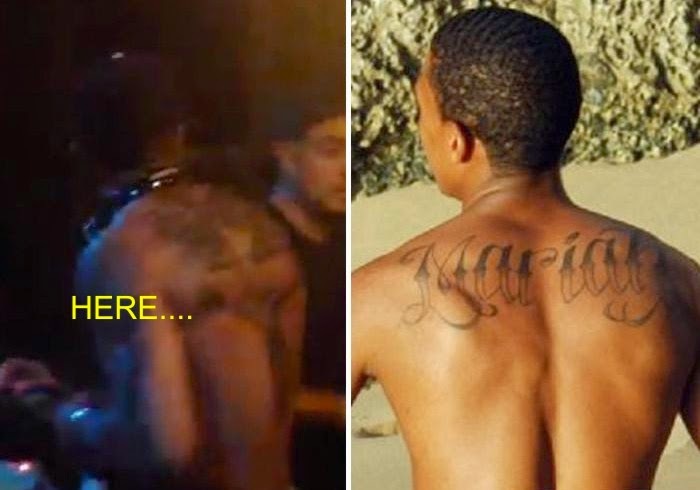 last night at a club in LA Nick cannon took off his shirt to show off his hot bod and, in the process, showed off the NEW tattoo that he got inked on his back to cover up MARIAH‘s name. Nick decided to get a massive tattoo of Jesus Christ crucified tattooed on his back because with christ, there is no divorce/ break up. Nick Cannon will be divorcing Mariah Carey … yet he’s turned her into Jesus Christ. Cannon was at Playhouse in Hollywood Thursday night to celebrate his birthday. As celebs are known to do, Nick took off his shirt at one point and revealed the massive new ink. It’s hard to make out the details from the photo, but our Nick sources say the tattoo shows Jesus on the cross with angel wings coming off the end the cross. And in the smoke department … Amber Rose was there. what?! hmmmmm....Amber Rose was also there with Nick partying hard.